A host of picture books return in new editions. 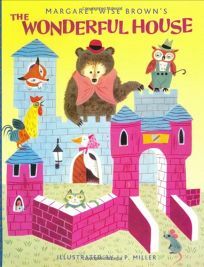 Margaret Wise Brown's The Wonderful House (1950), illus. by J.P. Miller, reappears in a larger trim size. Opening with a farmhouse (""Who lives here? A boy and a girl live here""), the book proceeds with a view of the barn and an assortment of animal homes (a nest, a turtle shell, etc. ).